Gambling in the United States has exploded over the last 30 years. More and more, budget-slashing states are becoming increasingly dependent on lottery and other gambling revenues, and politicians are lobbying for expanded gambling, including here in New Hampshire, where Governor Maggie Hassan has included a line item for $80 million in the budget for casino licensing fees. Hassan has been pushing hard for the construction of a single high-end casino near the Massachusetts border, but opponents point out that problem gambling is on the rise – in fact, pathological gambling is now being recognized on par with alcohol and drug addiction. 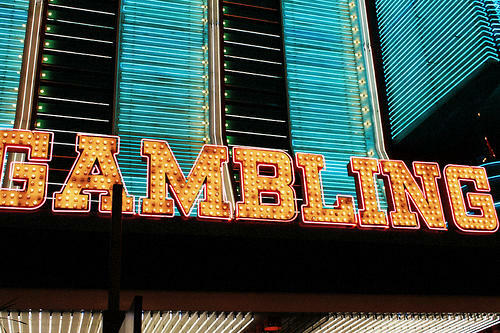 In 2011, we spoke with investigative journalist Sam Skolnik, whose book, High Stakes: The Rising Costs of America’s Gambling Addiction, unpacks the rise of politically supported gambling, as well as its many hazards. The New Hampshire Senate has voted 16-8 to authorize a single casino on the Massachusetts border. The Senate margin is the strongest yet for a casino bill. But the real fight on this issue will be in the New Hampshire House. A bill authorizing a casino with 500 slot machines and 150 table games faces its first vote in the senate ways and means committee Tuesday morning. The proposal enjoys the backing of Governor Maggie Hassan and calls for the casino to be located on the Massachusetts border. But as NHPR’s Chris Jensen reports, it’s also getting some attention in the North Country. As drafted, Senate Bill 152, envisions a sending part of of the casino’s profits to the North Country for economic development. Sen. Jeff Woodburn is a Democrat from Dalton.